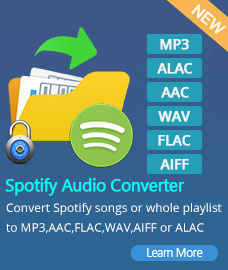 Any-Audio-Converter.com provides you the best iTunes M4V Converter, Audiobook Converter, DVD Ripper, Video Converter, DVD Cloner and DRM Music Converter! Any Video Converter Ultimate for Mac is an all-in-one media tool for Mac users. This versatile video converter can convert all kinds of video formats with super fast speed and high output quality so as to playback on hot devices like iPhone, iPod, iPad Pro, iPad Mini 4, iPad Air, Samsung Galaxy Series, HTC One, Amazon Kindle Fire, Google Nexus, Nook HD, Xbox One, Apple TV, etc. In addition, the best video converter can also extract audio from video and convert video to MP3, AC3, and AAC. 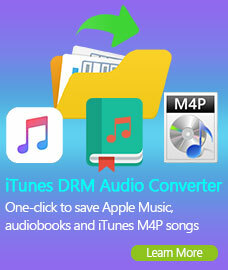 As a powerful Mac DVD Converter & Creator, it can convert even encrypted DVD movies and burn DVDs. What's more, Any Video Converter Ultimate for Mac can also work as a Web Video Downloader to download web videos from more than 20 websites and a Screen Recorder to record all desktop activities. Better yet, with Any Video Converter Ultimate for Mac, you can also edit videos and add special effects. As a Video/Audio Converter, Any Video Converter Ultimate for Mac can convert all kinds of video formats including MOV, M2TS, MTS, RMVB, RM, WMV, FLV, TS, TY, MKV, 3G2, 3GP2, AVI, MP4, SWF, DAT, TP, DV, ASF, etc. with super fast speed and high output quality. It can also exact audio files from DVD/videos and save as MP3, OGG, WAV, AAC, WMA, AIFF, CAF, AMR, RA, AU, MP2, AC3, M4R, M4A, etc. 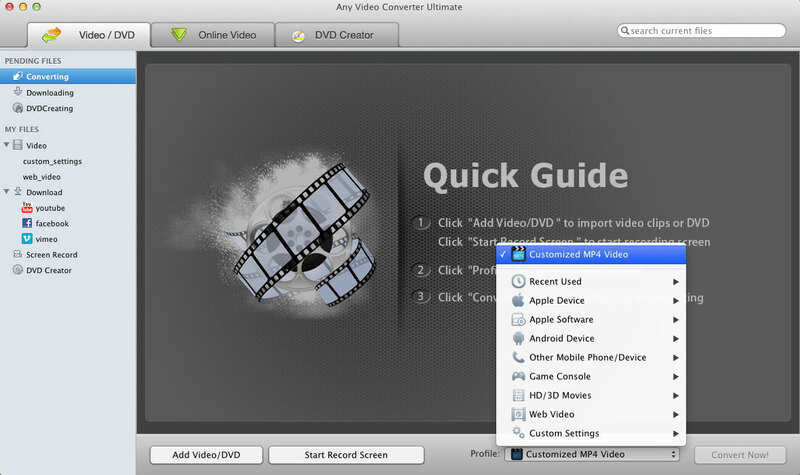 Any Video Converter Ultimate for Mac then performs as a powerful DVD tool which can rip even encrypted DVDs for backup and burn videos to DVD or save videos to DVD format. Any Video Converter Ultimate for Mac supports download web videos from more than 20 websites like YouTube, Dailymotion, Facebook, Vemeo, Vevo, Metacafe, Liveleak, etc. So with this powerful Mac Web Video Downloader, you can enjoy almost all kinds of web videos freely. With Any Video Converter Ultimate for Mac, you can easily download the online web videos to iPhone 6S/6S Plus, iPod, iPad Pro, iPad Mini 4, iPad Air, Apple TV, Android Phones, Google Nexus, Sony PSP/PS3, Zune, BlackBerry PlayBook, Nokia N-Series, Motorola Xoom, Samsung Galaxy Series, HTC One Series, etc. Any Video Converter Ultimate for Mac allows you to record all desktop activities to video for creating software tutorials, website demos. After finishing screen recording, you can easily import the recorded file to the video converter for editing. 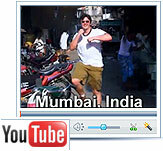 As a Video Editor, Any Video Converter Ultimate for Mac can clip and crop videos and DVDs freely. What's more, it also enable you to merge multiple files, preview videos when editing, rotate video, crop frame size to remove black bars and add watermark, etc. Perfect DVD ripper & video converter for Mac users. It allows you to rip DVD and DVD folder to popular video file formats, select subtitle and audio as you like, convert videos to iPod, iPad, iPhone, PSP, PS3, and more. Best DRM removal software which can remove DRM copy protection from M4V video files purchased or rented from iTunes, and convert M4V files to MP4 for iPod, iPhone, Zune, BlackBerry, etc. Copyright © 2006-2018 Anvsoft Inc. All Rights Reserved.